Lock in a great price for Antano Vila – rated 9 by recent guests! Room was ready even before official check-in hours. There was private secured parking area, which allow to save extra money for our entertainments. We were welcomed with smiles and friendliness. The room was with all facilities which you can need. The terrace view, especially during sunset was impressive. Surely we would want to come back there. Everything was good, very warm welcoming and just a nice place. 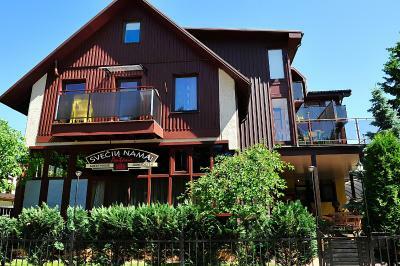 Great location in quiet part of Palanga, only 5 minutes to beach. Labai malonūs šeimininkai. Padėjo spręsti visus kilusius klausimus. Patogi ir tyli vieta. Arti jūra. Netoli centras. Kõik oli super. Hea vaikne puhas. Väga tore sõralik administraator..
Labai patiko ir esame patenkinti pasirinke Antano Vila. Labai faina vila, salia pusu miskelis grazus akiai isejus i balkona ryte kavos ar arbatos. Jura visai prie pat, masinai pasistatyti vietos yra. Salia yra ir nemokamas parkingas masinai palikti baigus viesnage Antano viloje. Only 1,300 feet from the Baltic Sea and the center of Palanga, Antano Vila offers rooms and apartments with kitchenettes, cable TV and free Wi-Fi. All rooms have private bathrooms with hairdryers and toiletries. Ironing facilities are available. There is a playground for children available in the summer 1,950 feet from the property. When would you like to stay at Antano Vila? Warmly decorated room with a kitchenette and a bathroom, as well as cable TV. Some rooms offer a balcony or a terrace. Two separate, interconnected rooms with a kitchen and a bathroom located on the second floor. Located on the lower ground floor, this apartment offers a kitchen with a microwave, as well as a bathroom with shower. A studio with a kitchenette with a microwave located on the second floor. This family room shares a kitchen with one other family room. It is located on the third floor and has a balcony facing a forest. This studio features a sofa, kitchenware and private entrance. Please note that this studio does not have access to the parking. House Rules Antano Vila takes special requests – add in the next step! Antano Vila accepts these cards and reserves the right to temporarily hold an amount prior to arrival. Please note that there are hours of silence from 23:00 to 07:00, parties and loud noises are strictly prohibited during this period. Please note, that there are limited parking places. Please inform Antano Vila of your expected arrival time in advance. You can use the Special Requests box when booking, or contact the property directly using the contact details in your confirmation. Kitchen equipement could be improved (f.e electric kettle), wi-fi quality was poor.